Anand the chess master lovingly called "Vishy". The tiger of Madras, he started his play at the age of 6. Anand the thinking master being to play chess in his own interest and by the age of 18, he became India's First Grandmaster with his unbelievable play. In 1987 he became the First Asian to win the World Chess Championship. He is a great inspiration for all our little Indian chess players and he is one of the Indian Personalities. Apart from all of these achievements he wrote a book with the name "MY BEST GAME OF CHESS" which fetched him an award from the British Chess Federation. So we wish him to achieve more and more in his life. Join in and write your own page! It's easy to do. How? Simply click here to return to Greatest Chess Players Ever. Vishwanathan Anand - The Indian Chess Master. 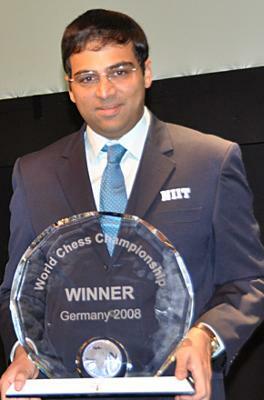 Vishwanathan Anand is a great sports personality of India in chess. He was born on 11th December 1969 in India to Mr Vishwanathan and Mrs Susheela Anand. He has a brother and a sister. At a young age his mother taught him the game of chess. On completing his degree in Commerce from Loyola college he chose chess as his passion. 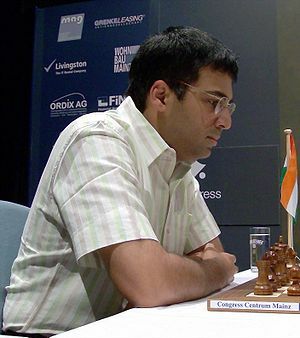 Anand got the Grand master title at the age of 19. He is the first player in chess history to have won the World Championship in all three formats namely the Knockout, Tournament and Match. He held the FIDE World Chess Championship from 2000 to 2002 and he is one the four chess champions who have crossed the 2800 mark in the FIDE rating list. In the April 2007 FIDE Elo rating list, Anand was ranked first in the world for the first time. He remained there for nearly 15 months and became the youngest person to achieve this milestone at the age of 38. But around October 2008 he dropped out of the top three for the first time since 1996. He was also the first recipient of the Rajiv Gandhi Khel Ratna Award in 1991–92, India’s highest sporting honor. In 2008 Anand received the Padma Vibhushan award from the Indian Government and and became the first sportsperson to get this award.